Microsoft Australia has launched a treasure hunt of sorts. Use the Internet Explorer 8 to search for Aus $ 10,000 on the website. 1. 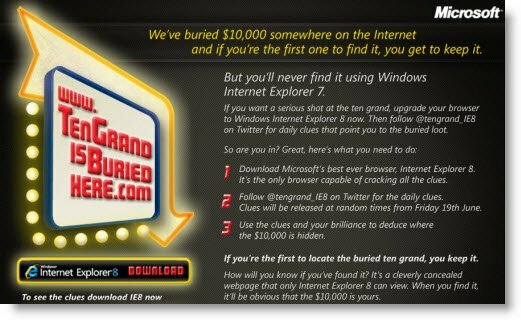 You have to have IE8 installed, as it is the only browser capable of cracking all the clues. 2. Follow @tengrand_IE8 on Twitter for the daily clues. 3. Use the clues and your brolliance to deduce where the Aus $10,000 is hidden. For more, visit Microsoft Australia.